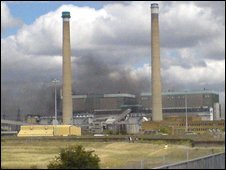 A fire which broke out at a power station in Essex has been brought under control, the plant's owner has said. Eight fire crews were sent to Tilbury Power Station in Fort Road after reports a turbine was "well alight". An Essex Fire Service spokesman said about 25% of the plant had been on fire. The blaze was under control by about 1745 BST, said owner RWE npower. Divisional officer Mark Osborne said it was thought to have started after a failure in a high pressure unit. "Crews did a magnificent job isolating the fire to where it began," he said. "It did spread to the roof of the turbine from the fifth floor where it started. "There are no casualties as power station workers were evacuated immediately." An RWE npower spokesman said the fire broke out at about 1500 BST. Essex fire crews attended another blaze at a pallet yard in Sandy Lane, Chadwell St Mary, at about 1615 BST and the fire was put out by 1830 BST. Ten crews were called out after the fire spread from a lorry. Assistant Divisional Officer Ian McLeod said: "Crews worked extremely hard at this incident to prevent the fire from spreading to an adjacent industrial centre and thanks to their efforts the fire was contained to the yard where it started. "We were hampered by a lack of water supplies but were able to get on top of the fire and contain before fully extinguishing it. "Because of the oil, fuel and other flammables this fire spread very quickly and it is thanks to crews hard work and professionalism that this fire was contained and did not spread causing extensive damage."